We might be losing an hour this weekend but Krispy Kreme will give you a free doughnut to help you get over it. 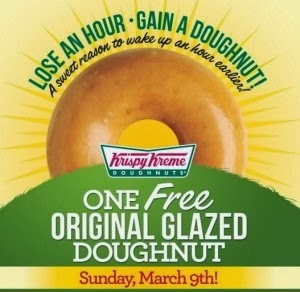 Go to Krispy Kreme on March 9th to get a free original glazed doughnut. Whaat! That's amazing! Why is there no Krispy Kreme near me! I wish we had one - closest one is over 4 hours away!! :'( Great post for those that do have one close, though!